Bienvenue sur Parisian Dream ! saisonnière, dans le quartier historique du Marais à Paris. located in the Marais neighborhood, in the heart of Paris. no longer continue the vacation rental. Thank you for the wonderful apartment, which exceeded our expectations and lived up to its name. Thanks for all your kind attentions, especially meeting us so late. Paris is amazing and weved the area around the apartment, especially the Place des Vosges. Every good wish for your future success. We wouldn't dream of staying anywhere else now when we come again to Paris. This part of our trip has been the best, thanks to our great home away from home. You've done a magnificent job here with all the nice touches - it feels just like home! We couldn't have picked a bettercation in the city. It's so close to everything. We know our friends will enjoy it this fall as much as we did. Thanks for the great wine and the flowers - a nice touch! We're off now to Chamonix, Nice, and Ambroise before returning to Paris for one last night. Thanks for making this part of our trip so memorable. What avely little jewel box of a home you have created! Thank you for sharing it and letting us experience a taste of what living here is like, including the meow of the kitty downstairs. Your neighbors have all been so kind when we've met on the stairs. We may never stay in a hotel in Paris again now that we've discovered your comfortable little corner of the city. Thank you again for thevely flowers and wine, the towel dryer, couch to collapse on, and many books that helped us plan our days. We want to stay even though San Francisco is calling us home. Best wishes. We had a joyous vacation here in Paris. The accommodation - the flat, our home - was an oasis for us. We enjoyed chocolat au pains and had a delicious meal at Bofinger. The Paris Walks guided two-hour walks are a delightful introduction to different neighborhoods and invite further exploration after the walk/talks. Your hospitality and care of us while we were here was very much appreciated - offering the umbrella, help at any turn, etc. Beaucoup de merci! We could not have had a better place to stay in Paris. It really was "our home away from home." The apartment is just beautiful. What a great job you've done on upgrading it. Paris - what a fabulous city to visit. All your guidebooks were a great help. Bonne chance. We came to Paris from New York City to get some much needed rest and to enjoy the food, wine, cheese, and culture of Paris. We succeeded in doing that and much more - including eating our weight in chocolate mousse and walking it off by seeing the city's wonderful sights. If you're a vegetarian, we highly recommend Le Potager du Marais (22, rue Rambuteau), Le Grenier de Notre Dame (18, rue Bûcherie), and Le Piccolo Teatro (6, rue Ecouffes). Thank you for providing a great apartment as a home base for our Parisian adventures. Weved it and weved the Marais. Bonjour! What a wonderful time enjoying this most beautiful city. After five nights in a tiny, noisy hotel room this was the perfect way to feel like acal. Your charming apartment was the perfect place to relax after a busy day of sightseeing, shopping, and dining with friends. Thecation was ideal! ve the neighborhood - Place des Vosges was my favorite spot. My friend's 40th birthday at Au Bistro de La Place (Place du Marché Sainte Catherine) was so memorable and delicious. I recommend celebrating a birthday this way and renting an apartment. This was a great experience. Thank you - merci beaucoup. I will spread the good word about this fabulous apartment! Au revoir - a bientot. Many thanks for letting us feel home away from home. We would come back late every night - exhausted byng walks and overwhelmed by the beauty of Paris - to the place we called home! Everything was above and beyond our expectations. As for Paris itself, we found it very charming and hospitable. All the museums, exhibitions, attractions filled our days. cation of our stay was ideal - we went everywhere by foot. It proved to be a great way to explore the city. Thank you once more! Best wishes to both of you!!. My mom and I had a rockin' time in Paris this past week, and it was so nice to have your fabulous apartment to come home to. This was my first trip to Paris, and I must say it's left quite an impression. The city is so beautiful, and I must admit it's not bad having fresh chocolate croissants for breakfast every morning - YUM! The Eiffel Tower was quite fun to go see, and we had a fantastic time at the Musée d'Orsay. We can't wait to come back. Thanks so much. Thank you so much for the use of the apartment! It was even nicer than we had imagined. There was so much to do in the neighborhood - good restaurants, good shopping - and weved the convenience to the Metro. Wish we could say that walking the stairs helped us tose weight but the food was just too good. We will definitely recommend your apartment to friends and family, and will try to get back soon. Merci! Even though we were only here for a very short time, we thought of the apartment as "home" and could hardly wait to return to its warmth and comfort after each exciting day. We felt like we were living lives of real Parisians, and its cosy memory will be in our thoughts asng as Eiffel, the Arc and theuvre, and all the other "dreams come true" of our first (but, we hope, not our last) adventure in Paris! All our sincere thanks and best wishes! PS: And we suspect that it was an "act of God" (or your own genius) when the English-TV wasn't working, making us feel, even more, that we were always in Paris! It was wonderful. Your apartment is fantastic. We absolutelyved our stay here. The streets were noisy and crowds just bearable, yet once we arrived home we felt it was all worth it. Weved the extra special touches, and felt at home. Thank you for making our stay so memorable and enjoyable. We had a great time staying at your apartment! We were off to a shaky start here in Paris, but eventually found our way around pretty well! Our honeymoon here was packed full of many eventful trips around your beautiful city! One of my favorite things to eat here - pain au chocolat! Yummy Anyways, we are now off tondon. Au revoir!! We had a really wonderful lune de miel / honeymoon! By the end of the week we felt like real Parisiens... if we could just speak French! 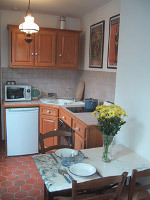 The apartment was quiet and serene... an oasis in the heart of busy / exciting Paris. Thanks so much for everything! A wonderful ten nights in Paris made all the richer by having this apartment. It was so relaxing to come back to in the evening. We had museum marathons and walked miles and miles to see as many Parisian streets as possible. We'll need to visit again to discover more of the neighbourhoods we are still discovering. A few tips for eating out for future visitors: My favourite restaurant was Le Reminet, on the Right Bank near Notre Dame. Bofinger around the corner near the Bastille monument was interesting for the history of the brasserie, being the oldest, and a pleasant dining experience (€ 34 for one for a complete meal with wine) - a terrific meal on St. Gilles north of Place des Vosges is the tiny Ali Angeli (great ambiance and quality food but book ahead) and a good meal was served at Le Square Trousseau, east of the Bastille monument on Rue Antoine-Volon. If you are out south of Sacré Coeur, on Rue du Faubourg Montmartre, try another old historic restaurant called Chartier: we were sat with a Parisian, a Flemish and a British person and had a great animated conversation. Hope we meet again you. Thanks for arranging the perfect ten days of sunny, spring weather too! Ha! All the best. Thank you for the use of yourvely apartment. We enjoyed the Marais. We saw the runners in the Paris Marathon! The coffee at the patisserie was yummy. Eiffel Tower is beautiful at night. Also had a delicious dinner at the restaurant L'Impasse one block away. Thank you again - we are off to see Nice and the Cote d'Azur! Au revoir. 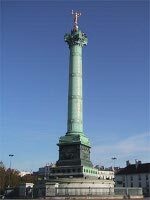 Thank you for providing a home away from home in the beautiful Bastille! Visit Penelope's bookstore on Rue St. Paul - The Red Wheelbarrow. She's delightful and she introduced us to Paris Walks, operated by Oriel Caine: two hour guided walking tours through a variety of neighborhoods. The best way to see Montmartre, we think! Weve,ve,ve the Marais and have found many quaint shops and wonderful cafes. Our nine days here have flown by and weok forward to our next visit... maybe next year!? We will certainly spread the world of your delightful apartment to our friends and family. Thanks again for helping to make our stay in Paris a memorable one. We had a wonderful time and weve the house! The futon was very comfortable for me to sleep on. I really like it here! We really hope that when we come back to Paris we can contact you and stay here again! We are leaving tomorrow and I can't even stand it! We want to stay! Well, got to go! If you want, go to the Eiffel Tower at night around maybe 19:30: the views are beautiful and the lines are short. It was much nicer to stay in a beautiful, spacious apartment than a cramped hotel room with other American tourists! We had avely time in Paris, even if it did rain for a majority of the time. We will be sure to recommend you to everyone we know back at home! Thanks! Perfect, beautiful and delightful apartment. We had a fabulous time and fully enjoyed Paris. We felt very much at home here andok forward to returning. Will recommend this apartment to friends and family. A+! Thank you so much! Great apartement! It was a pleasure to be here. We'llok forward to next time. Thank you both so much for helping to make our stay in Paris a memorable one! We are very impressed with the apartment and found everything to be above and beyond our expectations. It is obvious that you have taken great care in the restoration, decoration and presentation! We have many positive remarks to make at home regarding everyone we came into contact with here in Paris, and hope to spread good will back home! Thank you, thank you, thank you again for meeting us so late in the evening. We were very relieved to see yourvely faces at the end of the street. The week has been fabulous. We have seen, heard and eaten some great things (some delicious pastries from down the street were quite the treat). Thank you again. The stay has been great. Thank you very much for letting us use the apartment. It was veryvely, as is Paris! The futon was very confortable! I slept well every night we were here! Thanks again.